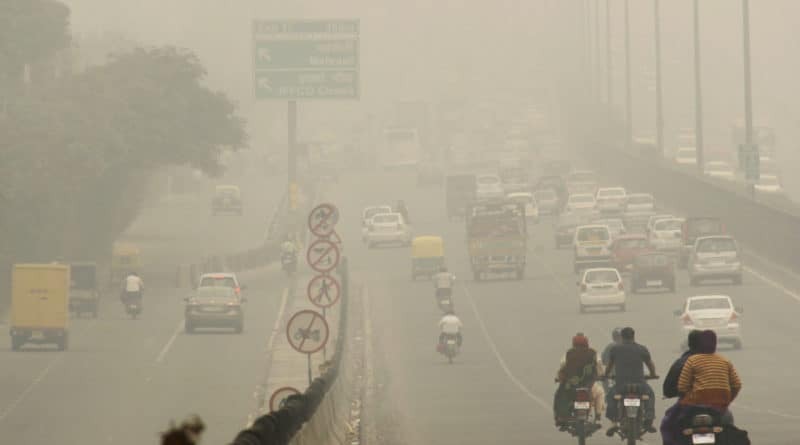 Road accidents and fatalities due to severe fog is a global phenomenon. Fog hampers visibility, mobility. Due to low visibility perception of the driver gets distorted while driving in a thick fog. As a result, chances of accidents increase many folds. This is because reduced visibility due to fogs results in collision of vehicles. In such a scenario, when you are on the road with your vehicle, following these tips can increase your safety and reduce the chances of accidents. At the first hand try to avoid journey if possible. If you have no option, plan your trip properly and set out early. Listen to the traffic reports on the radio and be aware of the weather forecasts. If you set off from home in a clear weather but meet fog en route, then slow down and halt at some service station and wait for the fog to clear. Turn your heater on to keep your windows clear. Driving at normal speeds in fog can be very risky. Make sure to slow down so you have response time if traffic suddenly stops or other issues surface. In a foggy weather, roads become wet decreasing the grip of tires. In such a circumstance having your vehicle at high speed can invite serious accidents and mishaps. In a reduced visibility, it is also difficult to see the potholes on the roads. At slow speed, you might hear the hiss of tyres of a car overtaking you that you haven’t seen. There is a common misconception among drivers that brightest lights work best in thick fog. This, however, is not is not true at all. In fact, in a thick fog use of high-beam spotlights make the situation worse by reflecting the lights back to you making it more difficult to see anything. So, if the visibility is less than 150 meters, always make sure to use low beam headlights. In city conditions when a heavy fog is around low beam lights makes short range distance more visible. Also, you are helping other drivers and pedestrians seeing your approaching vehicle in the fog. Even if you have daytime running lights, it is still a good idea to turn on the low beam lights, so that your brake lights will be on as well. This way, vehicles following you will have an easier time, seeing your vehicle as well. 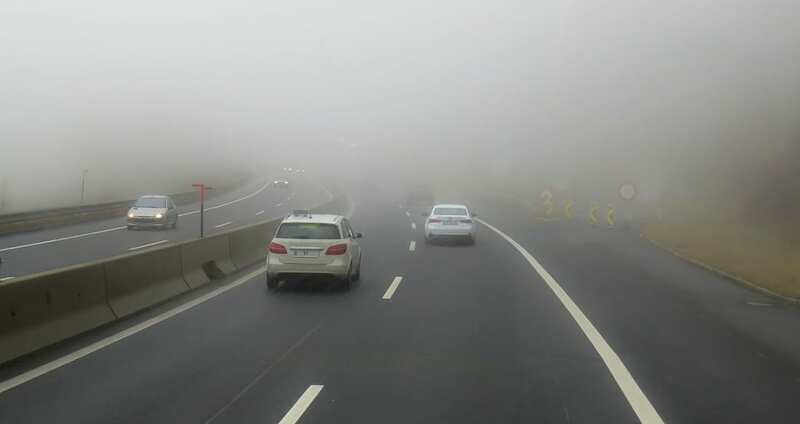 If you come across a thick fog while driving, never try to stop your vehicle in the middle of the roadway. This can cause a major accident as someone may hit you from behind. If it becomes essential to stop the car, find a safe place to park, away from travel lanes, and wait for conditions to improve. 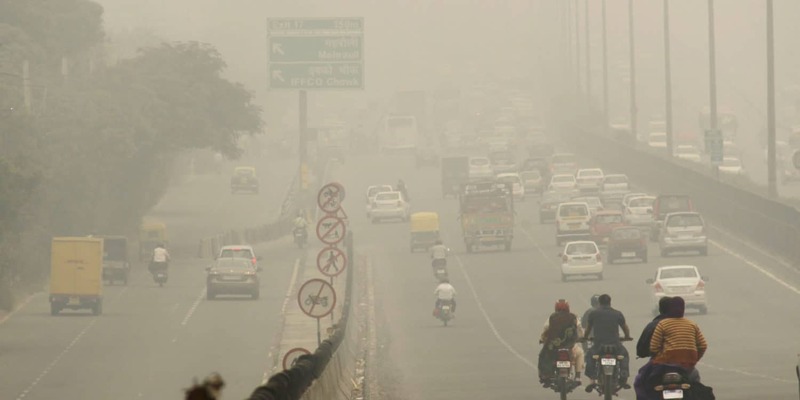 If you have no visibility, park your vehicle inside petrol stations or rest areas. While your vehicle is standing, keep your parking and hazard lights switched on. When you are clueless about how to move when you can barely see ahead, make a smart effort to look around to the left and right. Try to use the yellow painted line on the left edge of the road as a guide if you are having trouble following the road ahead. Always stay in your lane and don’t drift into the middle of the road in bad visibility. In the presence of a heavy fog, your distance of visibility is curtailed. In such a case it becomes important to create more space between your vehicle and the vehicle in front of you. A safe distance will give you more time to react if a mishap happens to the vehicle in front of you. When you are driving in the fog it becomes a multi-tasking job managing many aspects simultaneously. The journey through fog engulfed highways needs utmost care and alertness. Switch off the music/radio, stay focused on the road and do not enter into conversation with cabin passengers. Slide car windows down to listen to the traffic on the road. Highways are normally also installed with yellow light reflector boards for safe driving. If you follow these boards while driving, an accident can be evaded. Also, pay attention to other road signs and roadway markings while driving in fog. If you have front fog lights do not hesitate to use them because its flat beam doesn’t get reflected back more often as it is closer to the road surface. If you don’t have working front fog lights, then get them repaired or installed before the winter. Using fog lights during winter reduces the chances of accidents. It is notable that fog lights only works best at low speed. They add illumination to the road surface and road edges which makes driving easy in the fog. Also, do remember that fog lights should be used in conjunction with headlights. This is because fog lights are your personal visibility aid but others can only spot you through your headlights. When you need to set out for a long drive in foggy weather do not forget to keep essential items in your car to be used in case of emergency. Most cars come with plenty of room to store a few small items that will make an unpredicted emergency less stressful. You can include water, eating stuff and blankets which may come handy if your car breaks down or you are unable to go further. In a foggy weather condition always avoid using hazard lights of your car. This is because the vehicles behind your car might not be able to guess your path when you take a turn causing some major accident. Only use hazard lights when your car is parked by the side of the road. So, when you are driving in a thick fog always pay attention to the surroundings, remain alert and minimize distractions to safely get out of the situation. Guest Post by Himanshu Jha – Himanshu is the founder and editor of reviewtalks.com. He also loves to blog about latest happenings in the automotive world, car launches. He also likes to write reviews on newly launched motorbikes and cars.